You’ve started to warm up the grease to sauté some delicious meat or vegetables, and suddenly you get distracted by a phone call or someone ringing the doorbell. The grease begins to overheat, produces smoke, and — before you know it — it catches on fire. What you do to put out the grease fire can either work for you or against you, so we encourage you to keep the following grease fire safety tips in mind. Turn off the heat, but do not try to move the pot from the stove as the grease could splash on you or the kitchen surfaces. Put a lid on the pot or frying pan to cut off oxygen to the fire. If the fire is out of control, the most important thing to do is to call 911 and get everyone outside. Do NOT pour water on a grease fire. 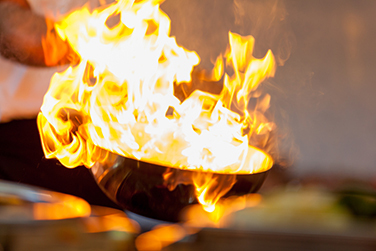 Water can cause the grease to splash onto yourself or kitchen surfaces and spread the flames. Do NOT fan the fire with a dry or wet cloth. This can also cause the grease to splash or fire to spread onto other surfaces. Do NOT use flour on a grease fire. While sometimes baking soda can extinguish a small grease fire (though not if the fire is too overwhelming), flour cannot and should not be used. Due to chemical risk of contaminating your kitchen, putting out a grease fire with your fire extinguisher should be the last resort. Stay in the kitchen and keep an eye on the deep fryer or frying pan. Slowly heat the oil to your desired temperature. Turn off the burner if you suspect the grease is getting too hot. Place the food in the grease carefully to prevent hot grease splatter.